This guide is for crafting with skills in FFXIV. All classes in FFXIV can benefit from crafting. This guide is based on my experience, hope you can benefit from it! It is beneficial to level all crafting classes to level 15 for cross class skills. The best way to level crafting is to take all crafting classes at once even if you are only interested some of the crafting classes. You can acquire all cross-class skills at level 15 by achieving all crafting classes to 15. 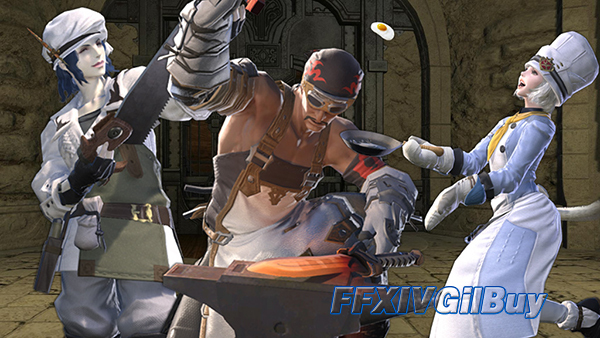 In FFXIV, all crafting are inter-dependent on each other at certain ares. The crafted products from one class can support another by taking up all crafting classes. Having more classes is always beneficial. But leveling all crafting classes at the same item is impossible at higher levels. Therefore, when you can’t level them all, you just focus on a few classes and buy stuff from market board to support your main crafting classes. The main sources of a crafting class come from the mainhand tool, chest piece and offhand tool. Having a good WVR can make life much easier as WVR can make the most of the pants and chest pieces for most of the crafting classes and gathering classes. BSM can make all kinds of mainhand/offhand tools. If you want to make millions of FFXIV Gil, it is of great importance to take up at least 1 gathering class. If you have gathering classes, you can get mats for free instead of purchasing from market. Having a gathering class also make you have a gathering retainer to do the work for you using ventures, which also benefit your crafting and income. Many players often neglect and underestimate the power of food. At levels as low as 10 to 15, food may not so important. However, having god food can having an extra 10% power for everything, like gathering, crafting, dungeons, etc. Also, you can level 3% faster for everthing too. The most important of all is that you can get Steady Hand II at level 37 CUL which is one of the most important cross-class skills you can ever learn. You can use a SALT COD which costs only 15 FFXIV Gil at any time to get food. It can boosts 4 control for 30 min and add 3% exp bonus. Alternatively, you can choose Stone Soup which costs 37 FFXIV Gil, but it can add up to 17 CP, which can be quite powerful when you try to HQ something.